If you’re a master artist, spare a thought for those of us who can do no more than draw things at their most basic level. For most of us, the thought of depicting a human figure realistically is a distant dream, and we struggle to paint even the most rudimentary landscape to a degree that wouldn’t make art teachers throw their brushes out of the window in dismay and protest. Yes, many of us would be laughed out of art class for our terrible drawings. What if, though, there was a way to make basic art look great? What if we could stick it to our art teachers by painting or rendering the most beautifully detailed, wonderfully-animated stick figure possible? What if we could transform the notion of terrible art and make it visually appealing? This question – and prayer – has already been answered by French studio Madbox and their game Stickman Hook. 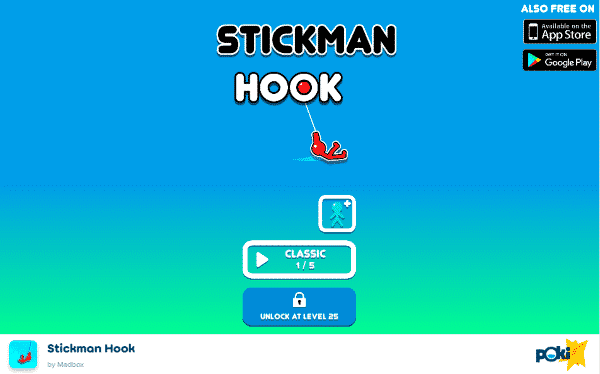 Until now, Stickman Hook was mainly available as a mobile title, having amassed over 20 million downloads on Google Play and the Apple App Store. A few ports and straight rips made their way to web platforms, but they were the exact same game as the original, complete with mobile aspect ratio. Madbox likes to do things right, though, so here is an exclusive web build of Stickman Hook that boasts over 100 levels, as well as a series of fun unlockable characters (burgers, anyone?). If you’ve played the mobile version, you’ll know what the craic is here in gameplay terms, but it’s worth a replay to see the improved presentation and feel the increased precision of mouse controls. If you’ve never played Stickman Hook on mobile, you’re in for a treat: the web version is, we’re confident in saying, the definitive edition of the game, and should be prioritized for new players over the mobile edition. That’s not to say the mobile version is bad. Rather, we’re simply saying that the web version of Stickman Hook plays better, looks better and feels better, making an already-excellent game fantastic. At its center, Stickman Hook examines an age-old conflict, one between video game protagonists and a series of numbered stages. There’s a good reason most 2D platformers divide their content up into stages – it works, and it allows players to take games at their own pace. Stickman Hook doesn’t deviate from this formula, but each of its levels is a carefully constructed physics playground, as much a showcase for the engine as it is a challenge to overcome. At Stickman Hook’s core is a physics engine that works in tandem with the souped-up animations to create a compelling, satisfying central gameplay loop. 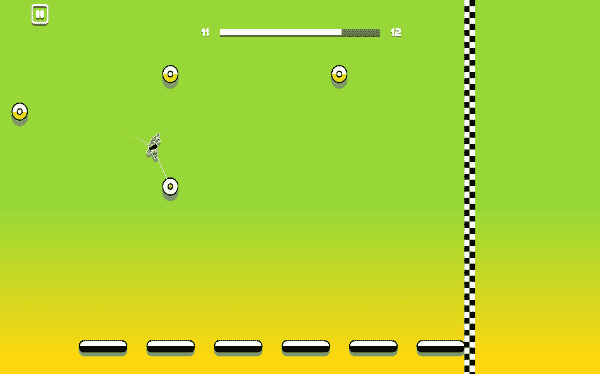 The titular hook is used to traverse the levels in its entirety; there’s no jumping, no movement other than the hook, and no powerups or weapons to collect. Stickman Hook joins the hallowed halls of games with just one central gameplay mechanic done well – it’s in the company of venerated classics like Portal, Splosion Man and Super Meat Boy. Like those games, Stickman Hook also finds ways to cleverly iterate on its central gameplay, meaning that no two stages ever feel the same. Things start off innocently enough, with players simply presented with a series of hooks and a goal to cross, but it’s not long before you’re swinging your stick man around hooks to fly backwards, leaping over sheer walls using a series of cleverly-placed hooks, and navigating deadly mazes of walls and floors with nary a jump to call your own. We’ve played many mobile-style games in our time, and we’ve enjoyed many of them, too. 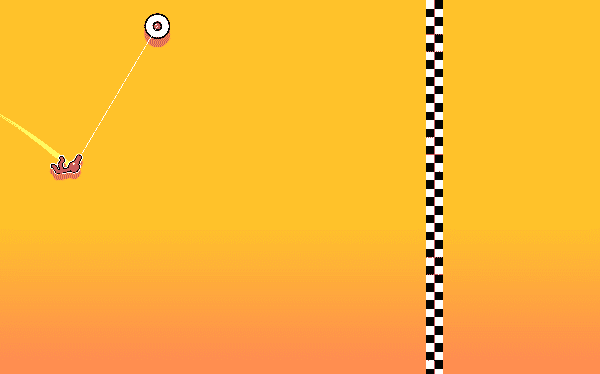 We’re repeat visitors to physics puzzlers like Angry Birds and indie adventures like Monument Valley, but Stickman Hook grabbed us in a way these games only fleetingly manage. Maybe it’s the sheer joy of flinging from hook to hook; fans of the Spider-Man games need look no further for a solid 2D interpretation (and perhaps the groundwork for a future Spidey platformer?). Maybe it’s the beautifully fluid animations, which see our titular stick man behaving just like the exaggerated human figure he is. Whatever the enduring appeal of Stickman Hook might be, it’s very clear that the game is an accomplished and enjoyable piece of work that should appeal to anyone with a strong sense of fun. The game is fairly bare-bones when it comes to alternative modes, but with close to 150 stages, that really shouldn’t matter, and the game is endlessly replayable anyway thanks to its core mechanics, so you’ll get your money’s worth, so to speak. Stickman Hook is a pleasure. It has barely any flaws other than a moderate lack of content, and even that’s just nitpicking. This is a consistently surprising, engaging and funny platformer that will keep you coming back long after you finish the sizeable single-player campaign. Long live the stick!